© 2013, 2014 Rob Petershack. Unauthorized use and/or duplication of this material written permission from me is strictly prohibited. I can be contacted at snap@tds.net if you are seeking such permission. Excerpts and links may be used, provided that full and clear credit is given to Rob Petershack and appropriate and specific direction is provided back to my original content. Please be aware that a significant number of images posted on this site have had their copyrights registered with the United States Copyright Office and all images are protected by U.S. law as well as International Law (i.e., the Berne Convention). I am a nice, very reasonable person so please just ask for permission before you do something you might regret. Sandhill cranes landing to join the congregation. This week’s Weekly Photo Challenge asks us to provide a photo of something new. Photos of a baby are the prototypical answer to any request for a representation of “new.” My family has been fortunate enough to have several children born recently and not surprisingly I have been taking more than a few pictures of them. I initially resisted using a photo of a baby for this challenge for fear of being trite. However, in thinking about a photo of mine that demonstrates “Possibility. Opportunity. Potential.” (as mentioned in the challenge), I realized that one of my pictures did that in a way that wasn’t just the typical cute baby photo. 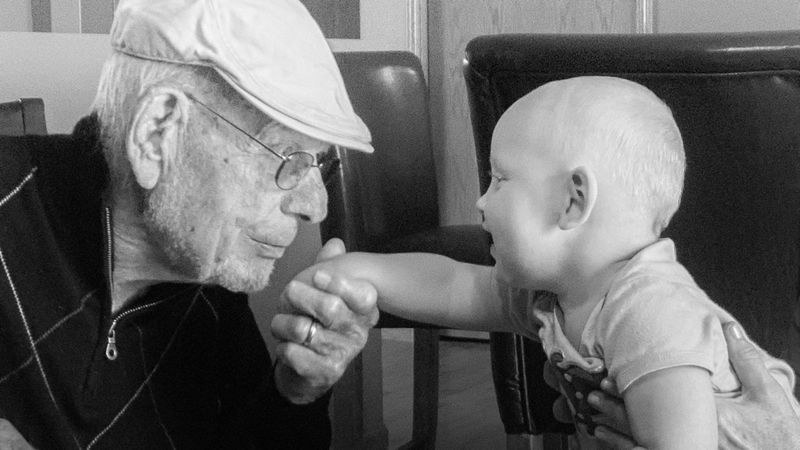 This photo is of my recently passed father-in-law and one of his great-grandchildren. As my father-in-law holds his great-grandchild’s hand and looks intently at his happy face, I see him looking into the past and future. His loving 91-year-old eyes and small smile show that he is content both with his life and with the promise of the child and of potential he embodies.